Gluten Free Caramel Pear Overnight Oatmeal Crisp Smoothie! 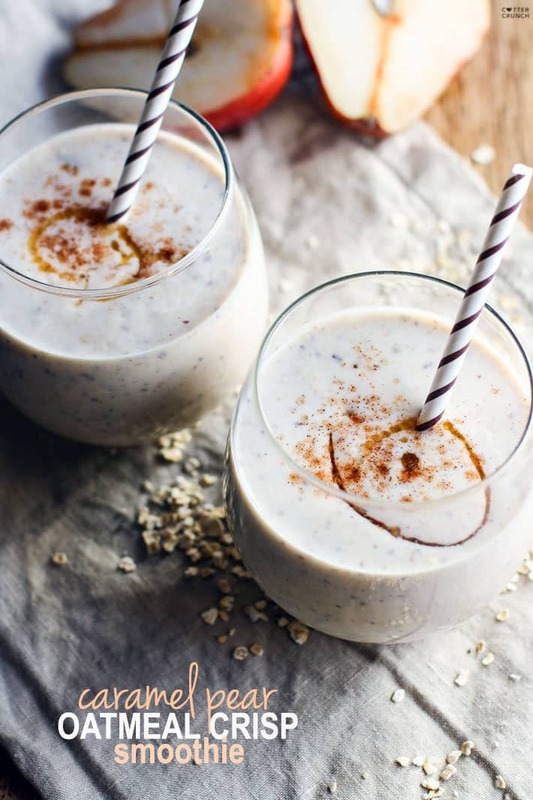 A healthy dessert style overnight oatmeal smoothie you can enjoy for breakfast, post workout, or anytime the craving hits! Super creamy, packed full of fiber and protein, delicious! Oh my, 2 days till NOVEMBER! I actually love this month so bring it! Bring on the coziness, the real beginning of holidays, and LATE FALL foods! You know, like Pear and Squash, and all that jazz! But you know what else happens this weekend? We FALL back one hour. Which means, for some, we can kinda sleep in? Yes? 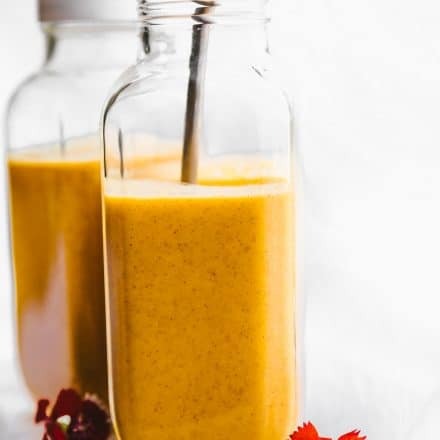 Actually, you are not going to want to sleep in with this dessert breakfast smoothie recipe I have for you today. Nope, in fact, you might just jump out of bed for it! Kidding, but you get my point. It’s darn tasty and of course “health-ified” for you. 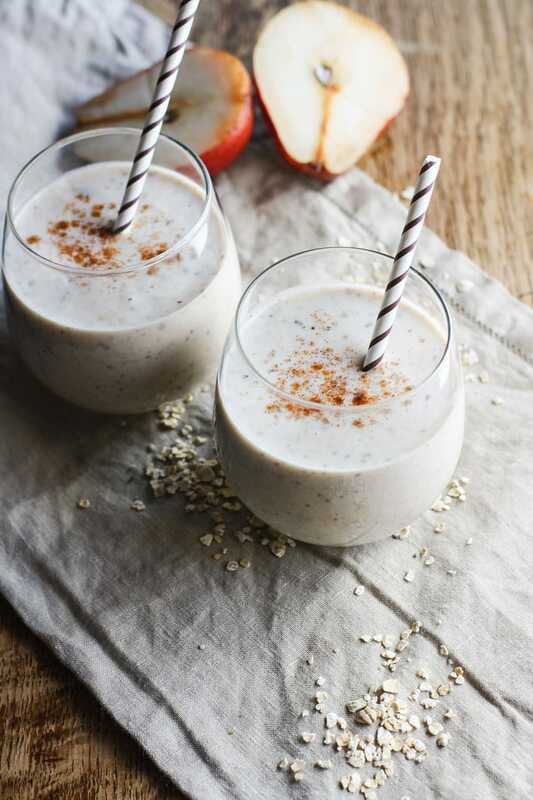 CARAMEL PEAR OVERNIGHT OATMEAL CRISP SMOOTHIE! Dang! That’s a long title for a smoothie, but it’s the truth and it’s just screams FALL! Don’t you think? Actually, the truth is that my husband took on more coaching, so we’re up every day at 5 am versus only 3 x a week. So, making this caramel pear oatmeal crisp smoothie the night before is some TRUE motivation to get up and get going at that hour. Ya know? Dessert at 5 am totally works! Especially when you add in caramel. Speaking of caramel, the caramel sauce is key. In fact, I made it just for this smoothie and it happens to be full of healthy fats and dairy free. So let’s back this up a minute. You have an overnight oatmeal style smoothie that is gluten free with dairy free/vegan options. It tastes like dessert. It’s packed full of protein and fiber. And wait, there’s one more thing. It can actually be good for your gut and easy to digest! Say what?! Yes, it sure can. Here’s how. 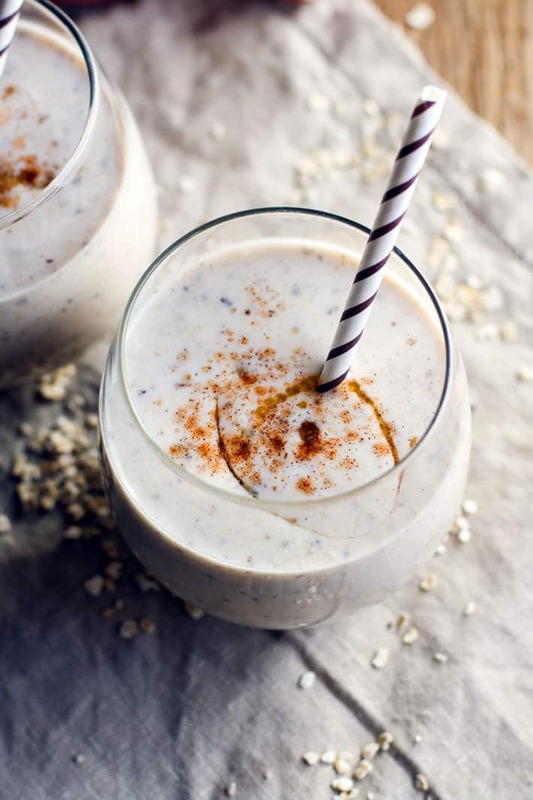 You see, when you make this dessert smoothie an OVERNIGHT oatmeal smoothie, you’re doing your gut some good. How? Well —-> When you prepare it beforehand, allowing the gluten free oats (grain) and any nut/seed to soak overnight in the fridge, it helps break down the phytic acid. Phytic acid (which I have regularly talked about here and here) can inhibit nutrient absorption if you gut isn’t healthy in the first place. This means that you’re even though you’re eating healthy, you could really be lacking in certain nutrients. So if you’re immune system is already low or maybe you’re stressed, fatigued, training HARD, then going with the overnight oatmeal smoothie option is probably your best bet! Although it’s not a necessity for this recipe. Make sense? You can still enjoy great immunity boosting benefits when you add in the full fat yogurt or even kefir yogurt. Although it’s optional, it can help boost your gut flora with healthy bacteria. 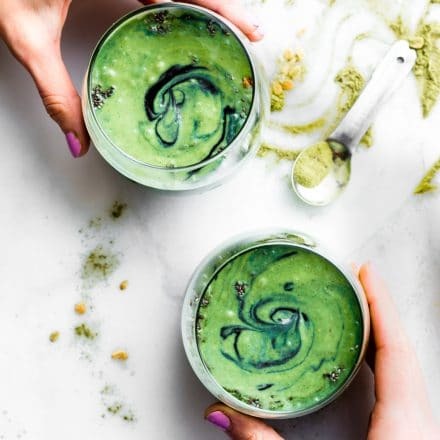 The full-fat version is also lower in lactose (aka sugars that many cannot digest), plus it makes the smoothie so much more creamy and rich, like true dessert form! WAM BAM now that’s a Healthy PLAN! Sorry, corny Cotter moment. 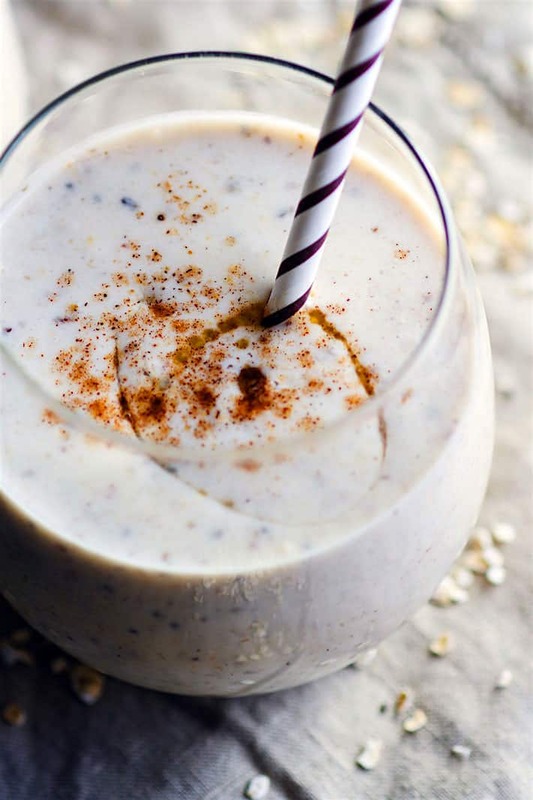 When making this oatmeal smoothie overnight, I like to use Lovegrown foods gluten free super oats, which also has chia in it! 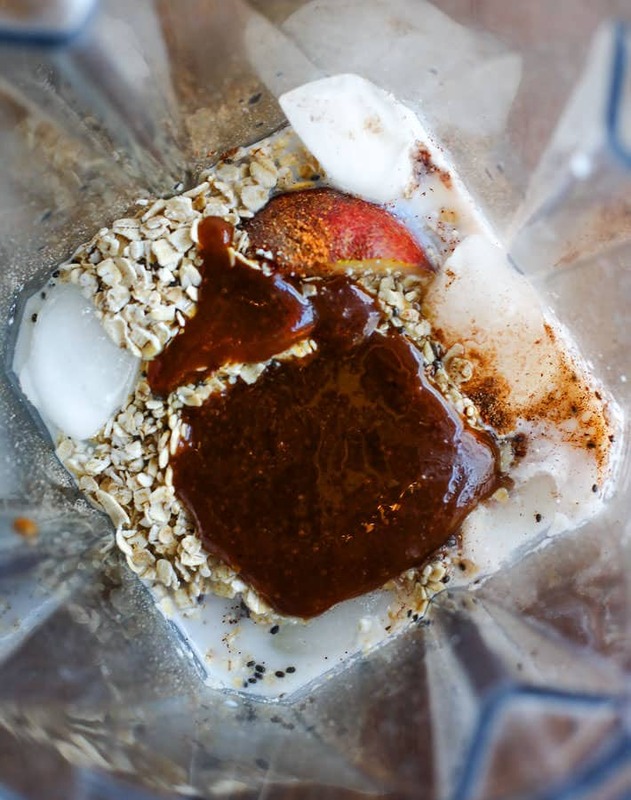 When you place the smoothie in a cup overnight, it thickens even more with the chia! So good! Gluten Free Caramel Pear Oatmeal Crisp Smoothie! A healthy dessert style smoothie you can enjoy for breakfast, post workout, snacking, or anytime the craving hits! Super creamy, packed full of fiber and protein, delicious, and made with wholesome real ingredients. First make your caramel sauce. 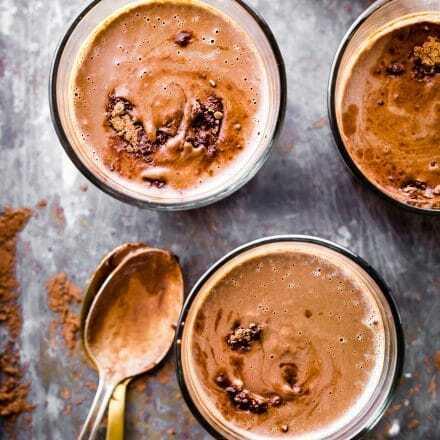 Mix together melted coconut butter, coconut sugar, extract, and honey. Mix until smooth. Next, place your remaining ingredients in blender and blend until mixed. Add your caramel sauce and blend until smooth and creamy. Pour into 1 large cup or 2 smaller cups. For overnight oat smoothie, keep cups in fridge for 6-8hrs. Stir in the morning and enjoy! 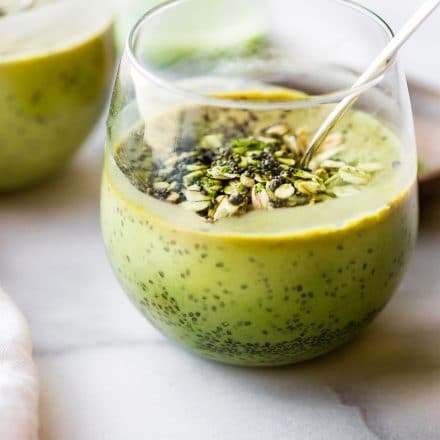 Lovegrown foods gluten free vegan super oats has chia as well, so when you place smoothie in cup overnight, it thickens even more with the chia! So good! Phew, so have I convinced you yet? A pear oatmeal crisp “dessert” smoothie for breakfast with bonus immunity boosting options sounds pretty good to me! But I may be bias. Let me know if you try this version yourself and report back, mmm k? Well, that’s the last recipe from me for easy gluten free breakfast week. If you missed the first two, just go HERE for pumpkin porridge and HERE for easy oven baked pancakes! This weekend I’ll have a round-up of gluten-free pancake recipes to share, just in time for pancake Sunday too! So stay tuned! Cheers! And Good luck to those racing NYC marathon this weekend. Favorite type of dessert style smoothie? 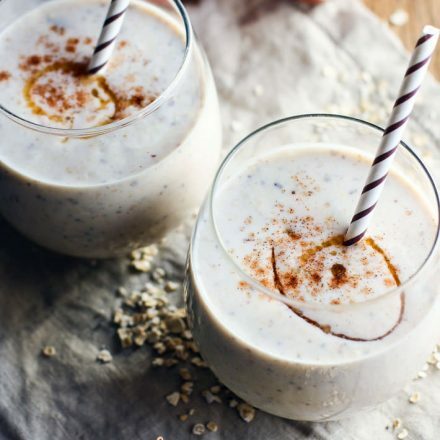 Ever tried an overnight oatmeal smoothie? You’ve totally sold me as you do with every recipe! Sounds perfect and I also love November and everything about late fall 🙂 off for my last 3 miler now! The problem for me is that now I will be waking up even EARLIER than everyone else! And I’ll be even more of a grandma in the evening. Don’t they understand that it is only when I lose hours that I seem like a quasi normal person? On the plus side, if I wake up early enough, this actually will still be dessert from the night before. Problem solved. haha you sound like me! i’ll make us both dessert. grandma! I love your verbiage! Smitten! Hehe yes! Ps why do you have to get up at 3? PPS i’m putting together a gluten-free pancake round up tomorrow, is it OK if I use your chunky monkey? They just look so good. Ha, of course we both wrote about oats today! Clearly, smart women think alike! This looks both delicious and beautiful as always. Blueberry oatmeal crisp! For the last month I’ve been eating a perfect unripe bosc pear every morning 😛 I can’t get enough! Favorite cold weather fruit! This sounds so good!!! I love all things oatmeal and smoothie ? 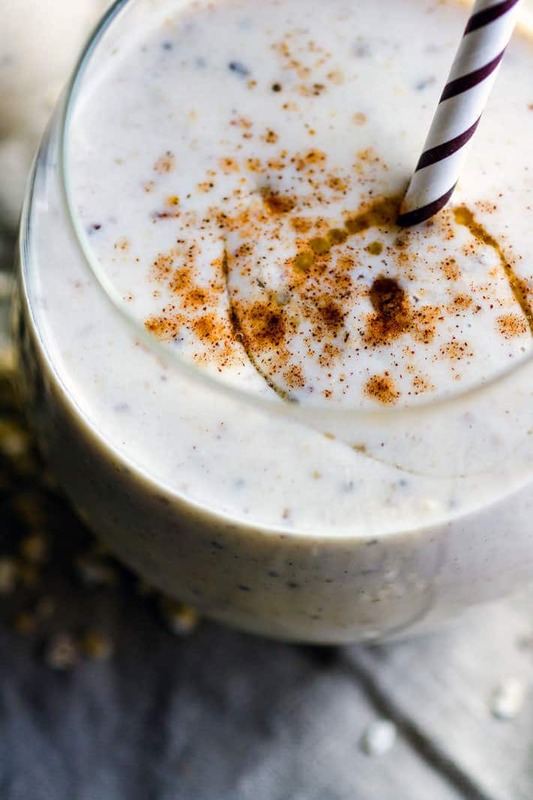 Whoa – pear oatmeal smoothie. Such a solid idea, Lindsay. I’ve never tried pears in a smoothie before! I can get on board with dessert at 5 am! ….except instead of 5 can we make it 7 am? 🙂 Thanks. I won’t be waking up any earlier or later this weekend. One of the perks of living in AZ is NO TIME CHANGE. I swear that’s at least 1/4 of the reason why I live here. I keep meaning to try soaking my oats the night before. Of course, I have all my absorption issues I should probably soak all my food. Haha! Corny Megan moment. I see some caramel in my future! Genius, as always. Yes, I love the pear + oats combo! The caramel sauce sounds too good – I want to pour it on top of those gluten free swedish pancakes for the ultimate dessert breakfast. well now that’s just genius! yea for sleep! reveling in it is a must! YES, this SCREAMS fall, in the absolute best possible way. Need it. My favorite oatmeal crisp is anything with berries! Better yet, berries AND apples. Nothing like dessert for breakfast!! Hooray!! I’m loving this smoothie, Lindsay and those pears… so happy to see them. They are such a delicious fruit… Thank you for your tips too on soaking oats… something I need to be more diligent about doing! PS I also LOVE the gut health tips. I’m all about supporting that microbiome! Fist bump. yea! gut health lovers unite! haha I am no pro. Smoothies are a little easier so this was actually done a week or so ago. But other times it’s usually 2 weeks i think. Writing is last minute. haha. always. Mmm! So many of my favorite things in one spot! My daughter is obsessed with pears…this would make a great breakfast for the two of us! I love this smoothie–and I love that since it sits overnight it is broken down and easier to diget–bonus!! I have to admit that I did have some pie for breakfast after Thanksgiving so I do understand why dessert for breakfast is tempting! I often add chia seeds to smoothies for extra omega-3s and fibre. I think it’s interesting that the oats you use have them included. I think I’ll keep an eye out for them at the grocery store. I’m with you. I’m all about pears this time of year, the riper the better. They’re so flavorful and full of delicious fiber. Seasonal fruit really is the best. Whoa I feel like I just hit the smoothie jackpot! I love caramel. I love pears. I love oatmeal. YES! Thanks for sharing this – I’m going to make it this week for sure. yea! you so did! let me know if you try it Devon!